← And The Great Big Cheese Cookbook winner is…. I’m rounding out basil week with an easy, savory lunch or dinner option. My garden is exploding with basil over 2 feet tall. While I plan on making large batches of pesto and freezing it for those cold Wisconsin winter days, I also like to add some fresh basil leaves to sandwiches. This grilled sandwich, a take on the classic Caprese salad, is one of my recent faves. Marinate chicken breast in equal parts olive oil and vinegar (enough to coat however many chicken breasts you plan to make). Refrigerate 1-2 hours. Preheat grill. Lightly brush bread with olive oil. Season chicken with salt and pepper and add chicken to the grill. Cook 7 minutes on each side, turning once. Five minutes before the chicken is finished, place bread on grill, not over the direct heat. 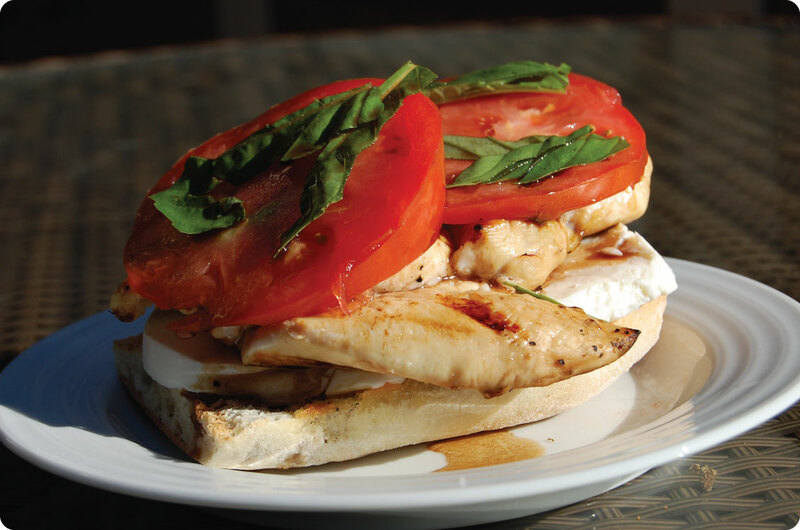 Once chicken is complete and bread lightly toasted, place fresh mozzarella on bread. Then layer chicken, tomatoes and sprinkle with slices of fresh basil leaves. Drizzle with balsamic vinegar. Depending on how big your chicken, tomatoes and bread, this sandwich may need to be eaten with utensils! We hope you’ve enjoyed basil week. We’d love to hear your innovations with basil!